When we are angry, more than our mood is affected. It can influence our decisions, our actions and our ability to do simple things. It’s probably obvious that we don’t want anger to be the driving force behind our choices, yet that’s what we tend to do. What’s more, our anger doesn’t just impact us, it impacts everyone around us, creating a ripple effect. And while we’re working through our anger, it’s important to approach it the right way. That means stepping back from some of our daily routines and rethinking our approach. Hiding our anger is often encouraged and is certainly easier than dealing with it. The evidence, however, says that hiding anger can affect our health. Studies show that holding on to anger can increase the risk of heart disease and impact our overall health. Just because hiding it is bad, doesn’t mean you should put your anger on display. Instead of reacting in the moment, find a way to work through your anger respectfully and thoughtfully. 2. GO TO SLEEP WHILE YOU’RE STILL ANGRY. To be thoughtful in our response to a heated situation, we may think “sleeping on it” is a good strategy. Well, it seems the age-old advice of “never going to be angry” is what’s best. Going to sleep with the feelings of anger burning strong will only reinforce those feelings making them even more pronounced in the morning. 3. GO FOR A DRIVE. Choose to travel on foot and stay out of the car whenever you can. When we are in a state of anger, our ability to focus and concentrate is diminished, which could lead to poor judgment on the roadways. The plus side of walking is that any form of physical exercise is a good approach to dealing with anger. 4. SHOUT IT FROM THE ROOFTOPS. We all need to vent from time to time, but it might not be having a positive effect. “Venting may make you feel different at the moment, but the change in an emotional state doesn’t necessarily feel better; it may just feel less bad,” says University of Arkansas psychology professor, Jeffrey Lohr. Venting may make us feel better, but it isn’t addressing the problem. When we are angry, it’s hard to present our side of the story with rational and thoughtful points. We often result in saying things we’ll regret down the road. Listen and then allow yourself to take leave of the argument to process the event. Leaving the argument doesn’t mean it’s over. It’s important that we prepare ourselves to revisit it with the right intentions and in a better frame of mind. 6. AIR YOUR GRIEVANCES ON SOCIAL MEDIA. When we post our arguments on social media, we can’t take them back. Just like arguing in the heat of the moment can lead to regret, so can posting on Facebook. Yes, you can delete it, but once it’s out there, it’s out there. 7. EMAIL THE PERSON YOU’RE ANGRY AT. Much like posting on social media, you can’t take back an email that has been sent. While writing and journaling are great ways of dealing and processing anger, sending those thoughts are a bad idea. Write the email and then delete or save it. Whatever we do, we shouldn’t send it. We can always revisit the email once our emotions are under control. 8. RESORT TO DRUGS AND/OR ALCOHOL. Alcohol is a depressant, and adding a depressant into a depressing mood is a recipe for disaster. Alcohol impedes our judgment and lowers our natural restraint mechanisms that prevent us from doing dumb things. This state of mind can lead to doing and saying things will come back to haunt us. 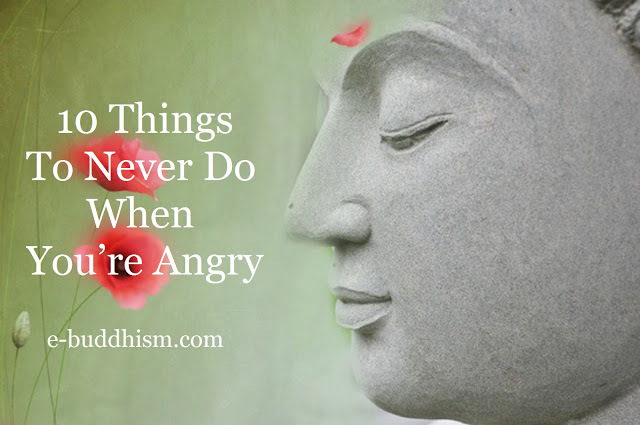 When we dwell on something that made us angry, it can often end up spiraling out of control. Overthinking the situation can lead to blowing it out of proportion and creating more points of contention than exist. Instead of dwelling on the situation, try having a direct and respectful conversation with the person involved. Emotional eating is never good. When we are in the midst of a crisis, we aren’t usually reaching for carrot sticks. Instead, we find ourselves reaching for foods that bring us comfort. Eating poorly during an emotional state can lead to a compromised immune system. Eating mindfully is never more important than when we are dealing with anger.